One of the bonuses of trying to adapt a quick bread recipe to gluten-freedom is that gluten is undesirable in wheat-flour items of this nature. So theoretically, if you replace the wheat flour in, say, blueberry muffins with a gluten-free flour, it should work out pretty well. Theoretically, anyway. Fortunately, this was the case with this recipe. Now, I’m not suggesting you can go substituting willy-nilly, using tapioca starch in place of wheat flour, or something like that. You do have to put some thought into it. Think about the flavors you want to work with (blueberry, banana, apple spice, etc. ), and pick some starch that will complement those flavors. Don’t try to mimic wheat flour, think about switching it for something more flavorful (and gluten-free), things like nut flours, or cornmeal. For example, in the case of blueberry muffins, I know that an almond flavor will go quite nicely with a blueberry flavor. So when I found a recipe on the Whole Foods website for an almond-flour-based muffin, I knew I had a great starting place. Since almond flour is expensive (and I didn’t really have a whole lot left after making macarons), I cut it with corn flour (a more finely-milled type of corn meal), knowing that the corn flavor would also complement the blueberry flavor. I left the butter content low, since almond flour has a significant fat content, but I think it’s needed for flavor. (If you’re concerned about calories, I figured out that each muffin has 176 calories. Make of that what you will.) Milk, honey, and spices round things out, while the variable milk content makes up for the natural size variation in bananas, and gives the recipe a consistent liquid content. Speaking of which, yes, there is a smashed banana in this batter, but it doesn’t bring too much of its own flavor to the party; it’s mostly there to add moisture and a little background depth and sweetness. You could certainly substitute any other smashed or puréed fruit, such as the standard applesauce, or whatever you like. I think a really over-ripe pear would be delightful. You could skip the flaxseed, but it’s so ridiculously good for you, I don’t see why you would. I tend to throw a little into most of my quick breads, not only for added nutrition, but because I love the slightly nutty character it brings. In gluten-free breads, it also adds structure; so if you make a habit of gluten-free baking, you likely have some on hand. If you do choose to omit it, though, you should replace it with corn flour, or additional almond flour. The bottom line here is that gluten-free foods need not be made up of a complex set of ingredients, something that’s trying to imitate wheat flour. It ain’t gonna happen. Xanthan gum and sorghum flour may be all well and good, but they’re never going to taste or act exactly like wheat flour. Don’t fight it; embrace it! Almond flour is delicious! It’s no hardship to be relegated to muffins like these. They came out really, really well! I was so proud. But color aside, these baked up moist and flavorful, the almond flavor not at all overwhelming, just a wonderful match with the blueberries. Just barely sweet enough, they could handle a drizzle of honey if you were so inclined, but I thought they were perfect as is. 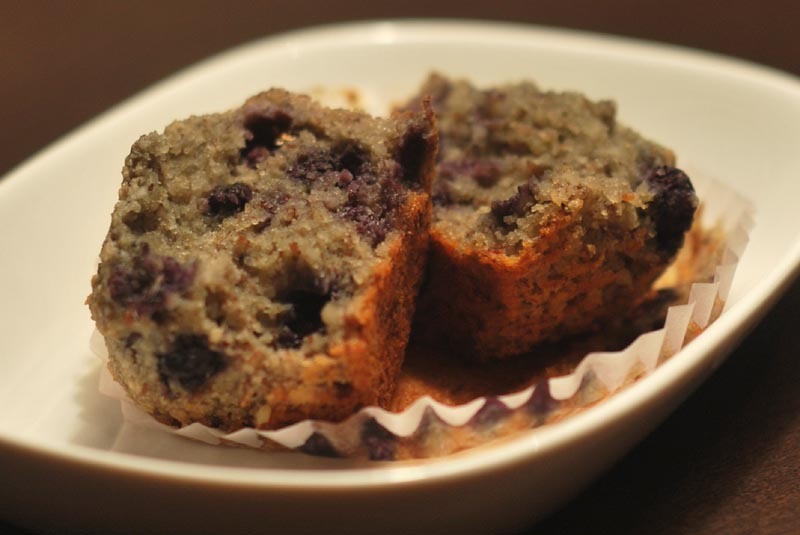 Okay, so they’re a little different from the standard blueberry muffin, but in the best possible way. These are blueberry muffins made a little more soignée, a little more posh. Wheat-flour-freaks, eat your heart out! With muffins like these, who needs gluten? 1. Preheat oven to 325º F. Line 10 cups of a muffin tin with paper liners. In a medium bowl, whisk all dry ingredients together (almond flour through sugar). 2. In a measuring cup, mash the banana with a fork until smooth. Add enough milk to measure 3/4 cup. Add the butter, honey, and egg, and mix with a fork until fully blended together. 3. Add the banana mixture to the dry mixture, and stir until incorporated. Add the blueberries and fold in quickly, until just evenly mixed in. Divide the mixture between the lined muffin cups. 4. Bake the muffins at 325º F for about 30 minutes, or until slightly firm to the touch, and just beginning to brown on top. Remove muffins in paper to a wire rack to cool completely. Serve warm. 1. If you can’t find corn flour (very finely ground cornmeal), regular cornmeal will do; it will just be a little more rustic in texture. 2. Be sure to fold the blueberries in quickly, before they thaw, and using as few strokes as possible, lest they turn your batter a purple color (like mine). Trader Joe’s sells Almond Meal which works much better, and isn’t all that expensive. I’d use rice flour myself, and increase the number of eggs. I did use almond meal; but it was Bob’s Red Mill brand. I find almond meal is expensive just about anywhere! Good luck trying the rice flour variation! Trader Joe’s Almond Meal flour is finer than Bob’s Red Mill. I have used both kinds and find I prefer the Bob’s when I don’t need a finer consistency as I do with cakes. I made these muffins with a slight variation based upon the ingredients I had on hand. I did use the Bob’s Red Mill Almond Flour and I used 2 large overripe bananas as I did not have any blueberries on hand. For the flour/flax addition, I used Whole Food’s 365 Baking mix and a jumbo sized egg. I am trying to cut back on sodium, and since I didn’t have kosher salt I used a tiny bit less of regular salt. I used 1/4 tsp of nutmeg in place of the allspice and Silk Soy Creamer for the liquid. The muffins came out rich and moist and delicious! This is a great base recipe – Thanks for posting it! Sounds like some great substitutions! I love it when people play around with recipes, and come up with a new and wonderful creation. Soy and banana sounds like a great blend with the almond base; I’ll have to give it a shot! I used ALL almond flour (from Traders) and no corn flour .. and used applesauce instead of banana as I didn’t have a banana on hand that day. We also used fresh blueberries as they are in season. It turned out amazing! We will definitely use this recipe again and again! Dawna: so glad to hear it worked out well for you! Thanks for all the substitution ideas… so, I used rice instead of corn, applesauce instead of banana, chocolate chips instead of blueberries & it is officially approved by my very picky daughters. Thanks for the recipe!!! !